express elevator 180 feet straight down with no stops until you hit the bottom. Respect the privacy of others don't trespass. Enjoy a virtual tour with my photographs and if you have questions send me an email. Also, if I have misrepresented anything, tell me so I can correct it. Drove up to Site 1, Champlain from Burlington, VT via Champlain Islands, Alburg and Rouses Point, NY. It was a Beautiful fall day in the northwoods. Arrived at Site 1, met the owner Fitz and had a brief tour topside. UHF antenna and hardened silo intact, Pump houses and soft VHF antenna stand visible - notice the coax in the conduit. On a side note, does anyone know what frequencies were used for the UHF and VHF antennas? The water cooling tower foundation remains and the silo cap has ornamental streetlights which were inherited when the site was bought. The concrete cover for the collimator was found by the silo cap and the end collimator tube was located about a foot underground. Fitz has put major effort into debushing and reclaiming his site and is starting to look like is was back in 1965 when the site was decommissioned. For an overall view of the site click Site Panoramics. You can pan and zoom if you download the file (the files are large 8 to 12MB). The original door to the LCC entry way has been refinished and has a water tank on top to supply water to the high pressure sprayer. The stairs have been covered with plywood to protect them from the material being removed from the LCC. Continuing down the entry way, looking around the first corner at the entrapment area (one wall has been removed) and then back at the 2nd blast door from the LCC stairway. Now looking back from level 1 of the LCC towards the stairway you can see some of the railings are still in place. Take a look at the Site Panoramics page and towards the bottom of the page you can see panoramic pictures of Level 1 and Level 2 of the LCC. Here's a picture looking up the escape tube (there's a fan topside). Below are various shots inside the silo. GOX vent tube on level 2 that would vent gaseous oxygen from the missile boil off valve just below the reentry vehicle. Notice the baffle in the vent which (looks like a horizontal bar where the tube meets the side of the crib). This would assure a smooth flow around a 90 degree bend with the super cold GOX. I'm not sure what the tubing is made of, but it had to hold up to very cold temperatures. I believe this is the part of the collimator tube which connected to the instrument pod on the missile to provide alignment with the north star (Polaris). Level 5, looking from the facility elevator area towards where the genset would of been. Notice the spiral stair case on the left - the only way up or down in the silo. Level 6 - This has only been out of the water for a short time, lots of muck down here by the collimator housing! Looking up up at a vertical crib lock. Silo is almost dry to level 7 - you can see the decking just below the water level. 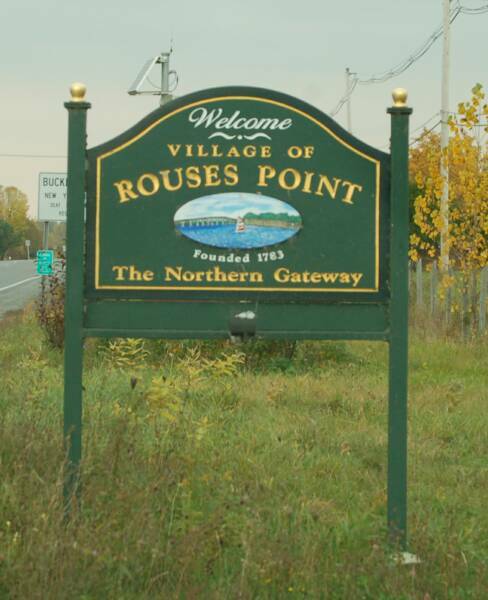 Spent the night in Rouses Point. Spent the morning back at site 1 taking pictures of areas I had missed the day before - like the site from the side where the diesel tanks would of been (the septic tank and field are to the left). It was then off to Swanton Vermont site 3. Unfortunately the gate was closed and locked. I still managed to get a picture of the silo doors through the fence. Next was Site 2 - Alburg. First ICBM site east of the Mississippi. The sign is located next to Alburg's visitor center. This site was also the lead site for construction. I'm afraid this road sign for the base will become more famous than the historical marker (check the spelling), notice the visitor's center in the background. This site is owned by the township and is used to store equipment, salt and sand for the roads. The silo cap is in the middle of the picture where the snow plow blades are stored. Most of the site has had rubble dumped on it, but I did manage to find the antenna silo, a control board and communications manhole cover. The LCC entry has the original door and the site is completely flooded. Stayed the night in Rouses Point again. Started the day off at 8:00am, great weather again. Drove from Rouses Point to Site 12 - Mooers. If you wondering why I'm starting at the highest numbered site after visiting Sites 1, 2 & 3, the answer is simple: The Air Force numbered the sites with the northern most site starting at 1, then continued clockwise numbering each site. The first three sites are fairly close to each other, only 20 to 30 minutes or so. 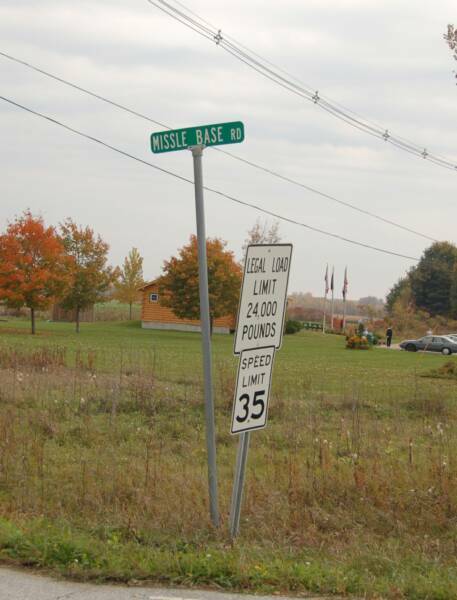 Site 4, which is in Willsboro is south of Plattsburgh by about 30 minutes, logistically not favorable to travel that distance in order to keep visiting the sites in numerical order. So, I'm traveling Counter clockwise from site 12 back to site 9, still a fair bit of driving but very doable. Site 12 - Mooers is owned by the township and is used for road operations. Silo cap has been completely paved (the snow plow blade is in the very center, just to the left of the telephone pole). 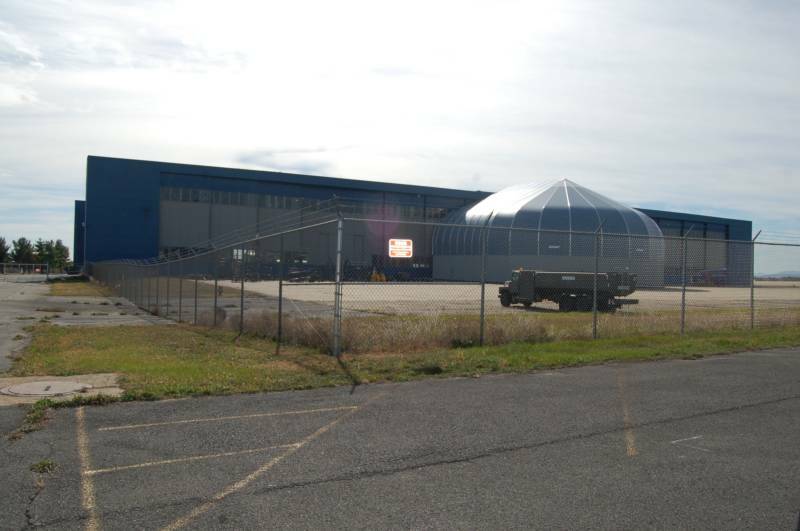 The two Quonset huts still exist along with pump house 1 and pump house 2. Not much left on the inside of the pump houses, just the well tops. The entry way was right next to a new building and the site is completely flooded. 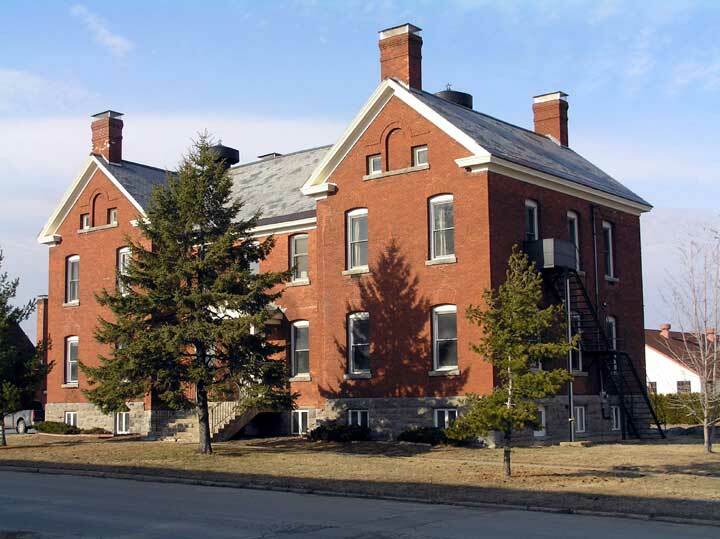 Site 11 - Ellenburgh Depot is privately owned by a landscaper who specializes in stone work. Most of the site remains intact although it is covered with rocks and landscape material. The site has been pumped down below level 3 of the silo and the stairway was dry. It appears pumping is continuing from the top of the silo cap. Rumor has it that this site could be for sale. Found the hardened antenna silo, communications manhole, and pump houses. The weather was a bit hazy, but the temperatures were in the upper 60's, very warm for this time of year. Site 10 - Brainardsville is privately owned by the same person as site 11. The silo cap is covered with landscaping materials and only one Quonset hut remains - converted into a residence. Located the hardened antenna silo and communications manhole could not find the UHF antenna. 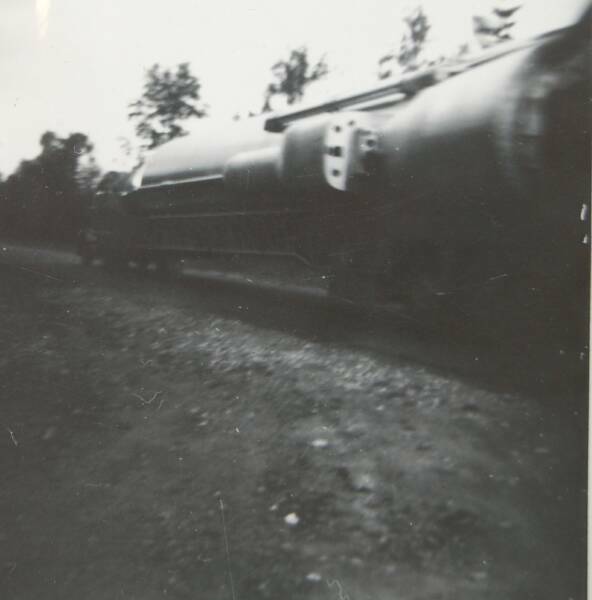 Both of the pump houses were intact as was access to the LCC via the escape hatch. This site has been pumped out below level 3 of the silo and the stairway was dry. The original door was on the LCC entry. Not much else to see at the site, so off to Dannemora. Site 9 - Dannemora is owned by the township. Access is uphill from the main road, you can just make out a brown Quonset hut. Both Quonset huts remain and as is popular around here, snow plow blades are stored on top of the silo cap. The silo cap is covered with loose sand and gravel, an electrical stub up still remains, fill & vent, exhaust and intake areas have been covered over. I was able to locate the LCC entry, original door remains and the site is flooded. Was unable to locate other typical landmarks (UHF antenna, antenna silo,etc) as the site has been filled with 6 to 8' of rubble and gravel. I did talk to one of the people working there and they mentioned when the township first moved in the silo doors were open. When they pushed the first one over, it broke loose from it's bearings and slid halfway across the silo opening. He said it was a major challenge to drag the door back to its proper resting place as the door pins had bent when it fell. Nice drive to Plattsburgh for the evening. - Building 100 - Temporary office space and testing lab in basement, known as the administration building, it's for sale if you're interested. Here is a picture of the control tower and alert hangers still on the flight line. The alert facility (mole hole) still exists, here is the entry gate and entrances to the facility. You can tell this facility used to be a high security area with all of the surveillance cameras all over the place. A coverall uniform, several fiberglass hard hats, a December 6, 1962 ceremonial key for site 6 "sell off" from the site workers. 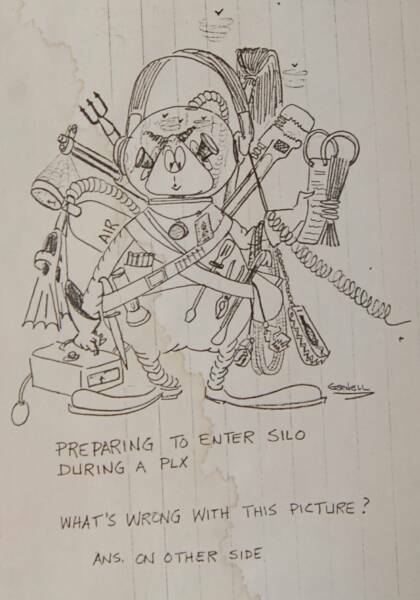 There is a picture of a remote camera that was used on level 7 for monitoring during propellant loading exercises and a binder of several missile related cartoons (no, I don't have the other side, anyone out there know the answer? -- I don't.). Along with the humor, there were training manuals. 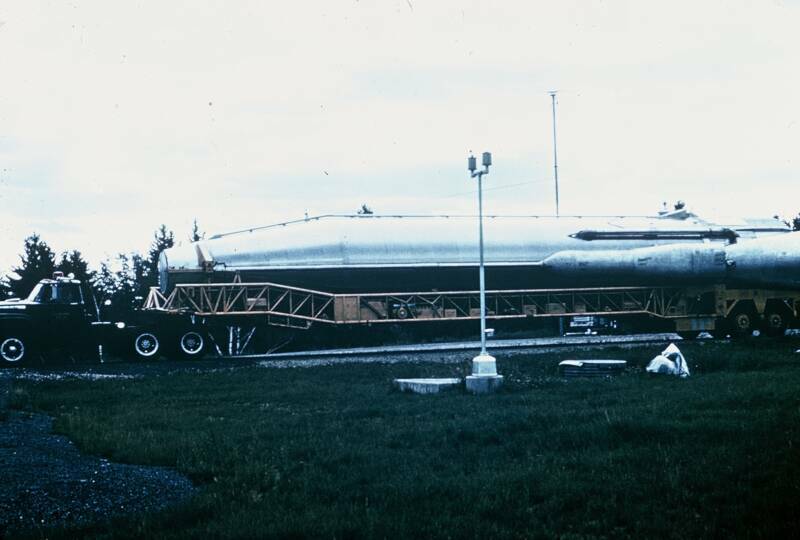 note books and pictures of an Atlas F missile being moved to a site. I was not expecting to spend much time at all in the museum, but as you can guess I was starting to run out of time. I really could of spent another day or two there. I was off to site 8 - Redford. The current owner did not want any visitors so, I took this picture and this picture of the access road.. If you're still interested you can see some of the site here (silohome.com) or here (ny17.com). Site 7 - Riverview was even more disappointing - I could not locate it, even with my GPS. I'll have to return sometime to photograph this one. Although all was not lost, I still took a couple of nice fall pictures. Site 6 - Au Sable Forks was up next. Unfortunately, the gate was locked to the access road. I'm sure glad it was a nice fall day to drive! At least the morning was enjoyable and driving through the back country was certainly relaxing, but I'll have to come back some time in the future to photograph these sites to satisfy my curiosity. Back again in Plattsburgh for the evening. Arrived at Site 5 - Lewis. This site owned by Alexander Michael, an Australian designer since 1998. Here is a view from the back of the property, Alex was preparing for his birthday party and put up the tent for people to stay in. The silo doors are open, and one has a ram attached, but not working yet. You can also notice damage to the concrete when the right side door was dropped by salvagers. Here is another view of the installed ram and a picture of the second ram waiting to be installed and a close up of the top of the ram. This site has been cleaned up and is in good shape. Locating the hardened antenna and UHF antenna was no problem. The base of the HF Discage antenna is in the center middle of this picture. Here is an interesting picture from the early 1960's and one taken almost from the same angle in 2008 (without the missile!). Completing the topside tour, here is the Collimator tube opening (used for pumping water out of the silo), entry way and escape hatch. Continuing down the entryway, through the entrapment area, blast doors and to LCC level 1 door (actually looking from the LCC towards the stairway). On to level 1 of the LCC. This is the most intact LCC that I have seen for any of the Plattsburgh sites. I found it most interesting that everything had a 'DYMO' plastic label attached to it; the ventilation system, sinks - including the faucets, shower, and towel dispenser - that's the military at its best!! Here is a picture of the escape hatch and the warning sign and a picture of the kitchen area, notice the suspension cylinder for the floor. Next is level 2 of the LCC. 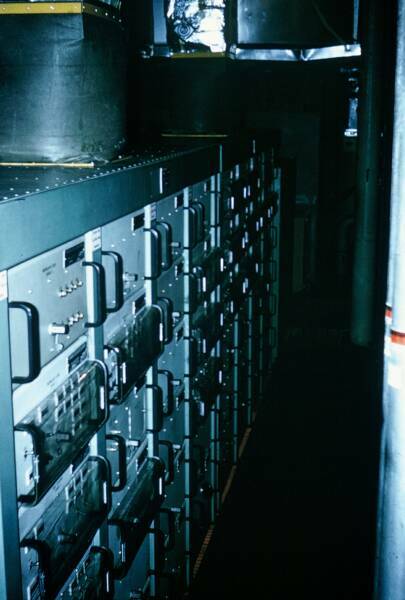 Several artifacts remain; launch console, electric switch gear, gate and entrapment area door control indicators, wiring termination racks and cabinets, and pneumatic and facility responders. The silo has had level 1 removed which makes you feel like you are entering a great open room on level 2 from the tunnel connecting the LCC with the silo. Here is a picture of one of the support rods that the cribbing hangs from. - Looking across the silo, not much left of the cribbing on the far side. For more pictures of this site visit Alex's website and Adventure Rider. Arrived at Site 4 - Willsboro and the rain had just let up. This site is owned by Tony L'Esperance, who runs his business "Atlas Atelier and Fine Art Gallery" from the Quonset huts. Topside, this is one of the more intact sites; the collimator tube is still covered and has the comm box next to it, the covers for the lube oil and RP-1 valve are still in place on the silo cap as is the cover for the escape hatch. Sadly the same cannot be said about the UFH antenna (under the rock), the hardened HF antenna or the cooling tower foundation which has seen better days. Also found the communications manhole cover which has become overgrown. The LCC entry way has an evergreen growing next to it and has the original door still attached. This site is completely flooded. If you wondering, I took about 1,600 pictures during the 5 day excursion. When you shoot panoramas it takes more pictures than I care to think about, especially when you shoot the same panoramic two or three times!! Ok, you've taken the time to read everything this far, why not send me an email and let me know what you think of this site! I am only documenting the 556th SMS from Plattsburgh, if you have any information about these site, let me know.